Update: MBTA announces station consolidation public meeting, Oct 23rd. 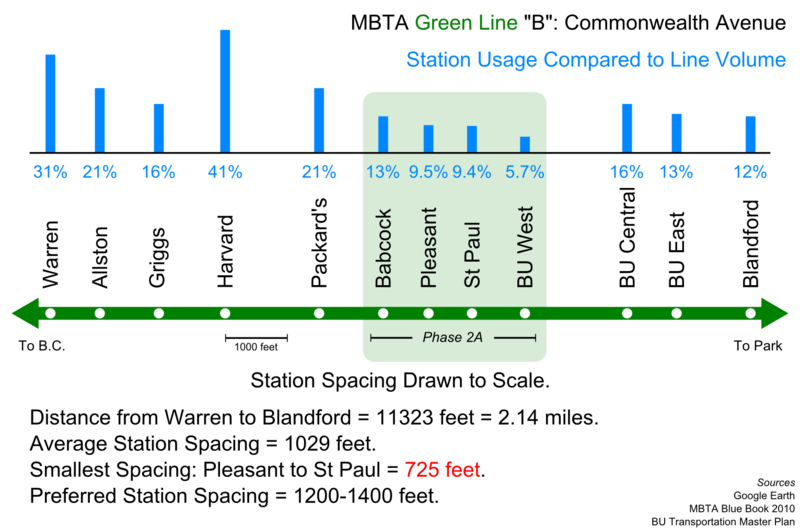 A little while back, BU put together a Transportation Master Plan that included some detailed ridership data about the MBTA Green Line "B" branch. I somehow missed this appendix while looking through their master plan in the past. Thanks go to Eric Fischer for alerting me to my oversight. The data include hour-by-hour breakdown of boardings, alightings, and line volume (the number of people riding through) for each of the surface stations Blandford Street through Warren Street, taken on a Fall 2010 day. It occurred to me that a station's importance is related to the number of people who use it, versus the number of people who would prefer to ride past it. This is also tied to the relative proximity of the stations. Multiple, closely spaced stations will divide up potential ridership and therefore, will mutually reduce the importance of each such station. The four stations in the scope of the upcoming Commonwealth Avenue Phase 2A street rebuilding project are very closely spaced. They are some of the most closely spaced stations in the entire system, as they are placed on four consecutive city blocks approximately 730 feet apart on average. That is a 2-3 minute leisurely walk between stations. Perhaps only Back of the Hill and Heath Street are closer. The diagram above is drawn to scale, and it shows how the stations are spaced relative to one another. Above the station names is a bar graph which shows the relative importance of each station, as measured by the number of people who use the station (boarding, alighting) divided by the number of people who ride through the station. It should come as no surprise to any frequent user of the "B" branch that Harvard Avenue is the most important station, by far, and that the four least important stations are: Babcock Street, Pleasant Street, St Paul Street, and BU West; the last being the most underutilized. I believe that this diagram makes a strong, visual case for station consolidation during the upcoming Phase 2A project, in addition to station relocation to better accommodate signal priority. I would like to see the MBTA begin a public process, much like they did ten years ago, to work on implementing efficient station spacing for this section of the Green Line. In addition to improving the experience for about 30,000 people, a shorter round trip time will save resources for the MBTA. If the scheduled round trip time for a train can be reduced by 6 minutes, then that means one fewer train is needed to operate the same peak schedule. That train can then be put to better use in other ways: to split it into more 3-car trains, to help bring back 5 minute frequency, or to send it out for much needed maintenance. Even more savings are available if the MBTA finally implements all-door boarding and transit signal priority, but that's another discussion. A quick note on the gap between BU West and BU Central: that space is mostly occupied by the Mass Pike trench, currently. The overpass of the Pike will be reconfigured as part of Phase 2B, and then I believe that BU has some air rights projects in mind. If station consolidation is properly implemented in Phase 2A, and if BU ever builds over the Pike, then it may make sense in the future to relocate BU Central further west. But until then, the most pressing issue is figuring out how to fix the Green Line problems within the scope of Phase 2A.